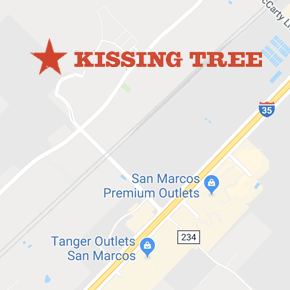 Kissing Tree came to life in 2018 with new residents, exciting amenities and outstanding events. Let’s take a look back on the biggest moments from a legendary year! We brunched with friends, danced under the stars and partnered with Texas Monthly for an unforgettable weekend-long event. Big & Bright celebration brought together local makers, musicians, chefs and more, and proved that everything really is bigger (and better) in Texas. Take a look back at some of our favorite moments. The Kissing Tree Golf Club officially opened to the public in October! The first semi-private course to open in Texas in more than six years, the newsworthy announcement was featured in the Houston Chronicle, San Antonio Express-News and Golf Insider, among others. The course serves as an extension of the natural landscape, making golfers feel like they’re in a Hill Country oasis. Book your tee time over the holidays. Our beautiful social building opened in the heart of Kissing Tree’s 20-acre amenity campus. From summer nights in the biergarten to weekly groups and events (more than 100 to be exact), Independence Hall was the place to be seen in 2018. Check out a full list of activities for December. While we loved the character of our temporary Sales Center (boxcar party, anyone? ), we were thrilled to open the doors to our state-of-the-art Welcome Center. It’s warm, bright, inviting and the perfect place to learn more about all things Kissing Tree. Schedule a visit to see it for yourself. You can now find KT’s resident food truck, The Rolling Stone, next to the Welcome Center with tasty food and grab-and-go snacks seven days a week. From homemade burgers to signature salads, you’re sure to find something to feed your appetite. See the full menu and learn more about Chef Kirk Doyle. Thanks for an amazing year, everyone! We can’t wait to top it in 2019. Be sure to follow along on our Facebook page to stay up-to-date on the latest and greatest happenings at KT.